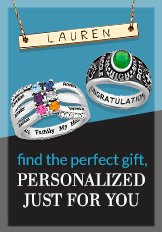 Let your style shine through with a pair of personalized hoop earrings. Featuring your name in elegant script, these Sterling Silver hoop earrings add a beautiful touch to any look. Rock these with your next outfit or customize it to make a thoughtful gift for a close friend.